Submitted by Norm Roulet on Sat, 02/17/2007 - 18:34. 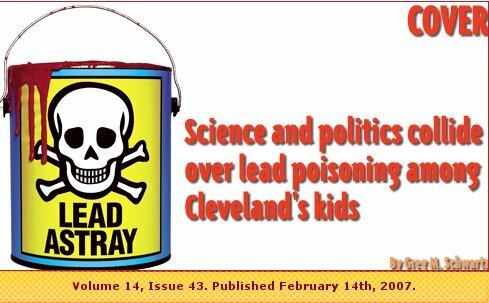 I was ecstatic to see the cover article "Lead Astray: Science and Politics Collide Over Lead Poisoning Among Cleveland's Kids", in the 02/17/07 Free Times. The article starts with the fact "that the federal Centers for Disease Control and Prevention (CDC) panel that advises the government on childhood lead poisoning had been politically compromised" and ends quoting the mother of a lead poisoning victom and ACORN member saying "No one wants the paint companies to go bankrupt, no one wants to put them out of business, we just want them to help clean up the neighborhoods and our houses." In between is a good overview of the lead issue and how lead poisoning data is often misused... and how a program in Cleveland called GCLAC is pushing to refine how data is used here. In that regard, it may sound boring, as it doesn't cover some latest development in lead litigation (a case against Sherwin Williams moved forward to trial this week in Mississippi). But it is timely, well researched, important and informative, providing readers with valuable perhaps life-saving knowledge and awareness, and that is a powerful weapon in the war against lead poisoning. Earlier this year, Scene Magazine had a cover story on lead poisoning, which also increased awareness on the issue in the community. Many bloggers in Cleveland write about lead poisoning often, as well. Alternative media has been the only media voice creating awareness on lead poisoning in this community, and has done a good job of that this year. I hope to see that increase even more in the coming years as we push to achieve 100% lead poisoning prevention by 2010.